Blog Homepage \ Favorites \ Oops! When I talk about the card collecting hobby I like to share some of the mistakes I’ve made because they tend to be more interesting stories. Let me tell you about one of the bigger ones. Years ago I would frequently visit a card shop in Niagara Falls to “get my fix” of cards. I liked this store because it carried a lot of oddball items and there was always something new to see. Back in the late 1980’s there wasn’t a basketball price guide. Why would there be? Everyone collected just baseball cards, right? I walk in one day and they had just opened a case of 1986/87 Fleer basketball to make sets. Why would they waste their time on a product that nobody cared about? Wouldn’t it make more sense to spend the money that they paid for the case to fill the store with Gregg Jefferies rookies? I remember the store owner telling me I should buy a set because this Jordan card will be worth a lot of money some day. 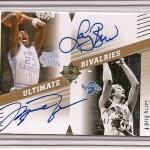 How could a basketball card be of any interest to anyone? This shop had a stack of Gretzky rookies for $25.00 each and no one was buying those, I figured they would be stuck with the Jordan cards too. I passed on the set because the $12.00 (with the stickers) just seemed ridiculous to me. Where did he come up with this price? The following week I went back to the store and the store owner was again trying to convince me that this is a set I should buy. There had to be around 40 of them sealed in plastic, stacked on the counter in a huge pyramid display. Obviously I was right, nobody wanted these sets. “Well that’s just ridiculous I said. “That card will NEVER be worth $12.00. I put the set back & bought another box of 1989 Topps baseball. I have bought and sold many Jordan rookies and 1986 Fleer sets since that day but I have never had one in my personal collection. Anyone interested in some Steve Avery rookies? 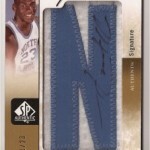 Phenomenal Pull: Michael Jordan Autographed Letter Patch 1/23! Too many than I would care to admit – how about selling a Milan Lucic young Gun for $2.00 – ouch! Yeah….that sounds just a little bit too low. 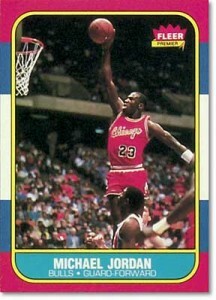 I remember my parents buying me a ton of 86-87 Fleer basketball packs.. They used to complain to me that they were too expensive.. but it was better than rotting my teeth on all that junk candy I pay for with the stolen money from my parent’s piggybank. They had tons of glass one gallon jars filled with change. Candy was so cheap back then too!! I loved the appearance & look of 87, even the 88 Fleer Basketball. Basketball was my #2 favorite sport being 7-8 yrs old. My #1 sport was soccer. All the kids were playing it up in & around Tacoma Washington. I moved back to Santa Barabra, Ca in DEC 89. Before I moved, I traded a lot of my baseball & basketball cards away. Being a kid, I didn’t know they were going to be worth something. I don’t know how many cards I put through the spokes of my BMX bike. I loved the sound they made! Made my bike sound like a dirtbike… haha. I was lucky to keep one MJ RC card… it has rounded corners & a thumbtack hole at the top. probably couldn’t even get a BGS grade of 2. I traded for another MJ, with slight rounded corners, but a lot better condition than the one I had.. I traded a local card shop dealer around 92 or 93. I was 12-13 yrs old then. Didn’t know better. I traded a bunch of shaq RC’s, along with the first Hoops rookie set redemption, which I didn’t understand what it was at the time. Luckily I pulled another one about two months after the first one.. which I’ve kept in my PC. 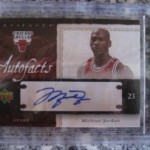 I think I got the MJ for about $200-250 in cards that I traded away.. 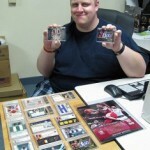 I turned around & sold the MJ RC for $200 cash at a card show to an out of town card dealer. He gave me about $30 worth of packs of skybox along with the $200.. which I wanted to use to take a trip to Sixflags Magic Mountain in Valencia, Ca & buy some new clothes & nike’s. I stopped collecting around 96. Never bought too much of Kobe’s rc year. Collected for a short period in 99-01.. then let the cardboard addiction take over my judgement in April 2007. 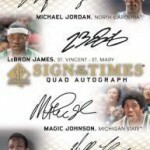 Started collecting the Ultimate Collection 2006-07 set, including base, legends, & RC/autos.. Completed the entire set, along with Ultimate Signatures.. which I loved. that’s the set that got me addicted. There are a few redemptions that were never filled.. cards never signed or released.. so I feel like my set will never be complete. I am extremely upset with Upperdeck not being able to release a complete set. They could of reproduced the cards without the auto or replaced them with somebody else, but same # in the checklist.. 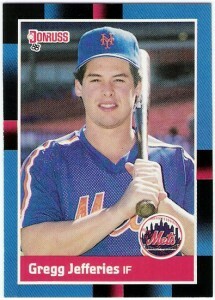 I kind of wish i had my Jefferies stockpile still. For old times sake. This happened to me too at the Ben Franklin’s in Washington, Illinois. There were a couple of open boxes of 86/87 Fleer BkBall sitting next to all the ‘great’ 1987 baseball boxes. I was so stupid for only buying one of the boxes for $15.50. I also bought a box of Donruss, Fleer, Score, and Topps while I was there but always dream of grabbing the second box of Fleer Bkbll cards. The box I did get had 3 Jordans, 2 jordan stickers and about the same of all the big names. When you only put 132 cards in your set the boxes tend to be good. Ended up trading all the Jordans for a ton of Shaq cra…..stuff. Don’t ever do that kids.